Ok, here goes. I’m not the biggest fan of pumpkin based baked goods. Unless there’s more chocolate than pumpkin involved, I don’t even think twice about it. Phewwwww. Feels good to put that out there! So while the whole world is like pumpkin this and pumpkin that, I’m over here thinking about what else I can do with the bag of chocolate chips sitting in my fridge that doesn’t involve that bland squash! Sorry, it had to be said. All the great combos have been done, including one of my favorites – chocolate and peanut butter. 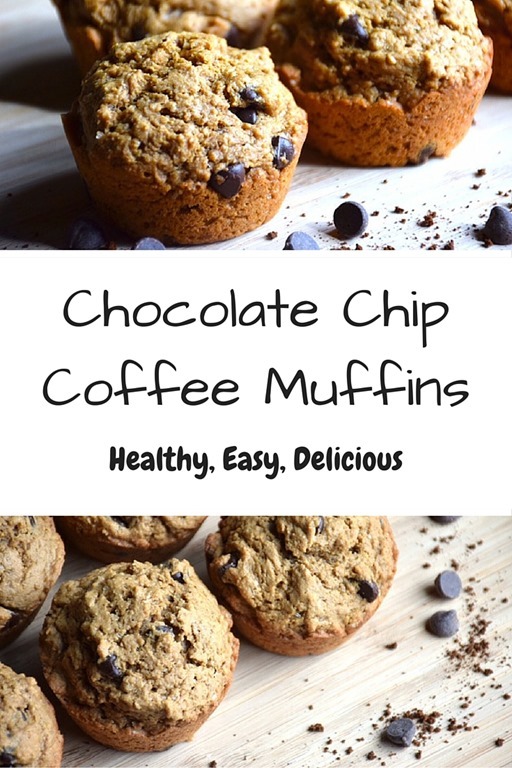 That got me thinking about what else I could incorporate my chocolate chips with to create a healthy, hearty snack for us. I kid you not, I came across a recipe booklet my mom photocopied for me YEARS ago that same day. And towards the end of the booklet was a recipe for Cappuccino Muffins. Coffee in muffins? Sure why not. It had to be better than pumpkin, right? Well, it was! 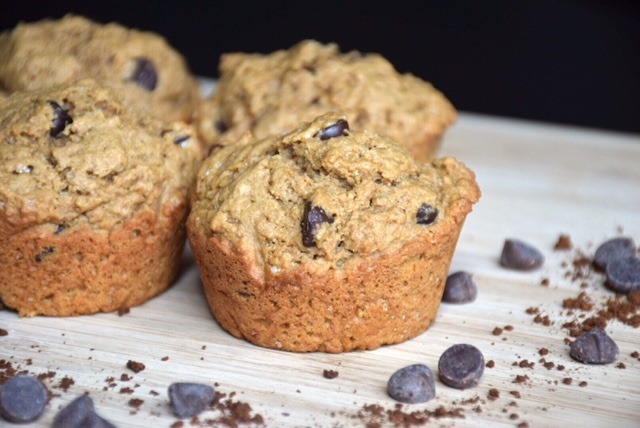 Even with my healthier tweaks, these Chocolate Chip Coffee Muffins turned out great. But don’t expect crumbly, buttery, overly sweet muffins. These bad boys are dense, a little chewy, and super hearty! There’s a subtle coffee flavor laced throughout, and when you take a bite full of chocolate chips, well, that’s just mocha heaven. Best of all, these muffins are husband approved! I’ve noticed a trend this week – he comes home from work, eats dinner, and then asks if I have any more of “those coffee muffin things” left. Success! Vishnu prefers the muffins warmed up for 20 seconds in the microwave. Me? I eat them cold (I store my muffins in the refrigerator). They’re delicious either way so take your pick! 3. In another bowl, whisk together the milk and the coffee until the coffee granules dissolve completely. Then add the coconut oil, egg, and vanilla extract. 4. Fold the wet ingredients into the dry ingredients until combined (batter will be thick). 6. Spray muffin tins with cooking spray. Fill each tin 3/4 of the way to the top. Bake for 17-19 minutes or until a fork/toothpick inserted in the center of a muffin comes out clean. – If you’re not into the whole wheat thing, use all purpose flour. – Feel free to use whatever milk you have on hand, although I would stay away from skim or 1%. Pumpkin lovers, don’t hate me. But if you find yourself left with unpleasant feelings after reading the beginning of my post, just make these muffins and we’ll be fine! Are you a pumpkin lover? What’s your favorite muffin flavor? i love all things pumpkins, as if you couldn’t tell already..i am totally on board with all things chocolate and coffee! my boyfriend thinks i always make things with beans, quinoa, and now pumpkin too, so its nice when he likes it too. dixya @ food, pleasure, and health recently posted…Why I Ran a Half-Marathon? I am a pumpkin lover but I can get behind this coffee/chocolate goodness! YUM! I think you’d really like these muffins. They’re a perfect breakfast on the go option. I remember you mentioning that you’re not a pumpkin fan in a blog post! And cold baked goods are the best – the flavors are that much stronger I think! And just another reason why we get on so well- not a fan of canned pumpkin AT ALL but love coffee-flavored anything…even better when it’s paired with chocolate!! Any idea whether regular wholewheat flour will work in this recipe? Unfortunately wholewheat white flour isn’t available here! Otherwise I might try out this recipe with oat flour and hope for the best! And I think regular wheat may work, although I imagine the texture may be a bit grainier. I think oat flour would work really well though! Let me know if/when you try this out! Wait what?? How can you not love pumpkin?? Lol. I get it though, pumpkin isn’t everyone’s thing. I personally love pumpkin but I also love chocolate and coffee so these muffins are right up my alley too. My current favorite muffin flavor (it changes constantly) is whole wheat blueberry.